Shampoo Cabinet Assembly Required. This cabinet is easy to install and has a small shelf for your shampoos and all other styling products. The side entry door provides easy plumbing installation and small storage area. 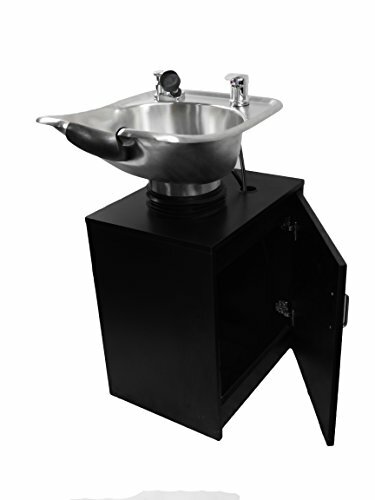 22" W x 26"H x 18"L Small shelf is 3.5 inches deep Unit Dimensions (with bowl installed): 20L''L x 10''D x 18''W' Tilting Stainless Steel Shampoo Bowl This is a high quality stainless steel shampoo bowl. It is made from commercial grade 2.0 mm thick stainless steel with a brushed finish that will not stain and is scratch resistant to provide long lasting durability and service. •Commercial Grade 2.0 mm Thick Stainless Steel •Top Quality with American size hardware including. Includes: -Hot & Cold Faucet -Vacuum Breaker -Spray Hose -Water Proof Comfort-Gel Neck Rest -Stainless Steel Drain -Easy Clean Hair Trap: A Professional grade hair trap helping to protect against loss of jewelry, contact lenses, or other valuables that can be accidentally washed down the drain. This bowl uses U.S.A standard hardware and is compliant with the Uniform Plumbing Code (UPC).Return policy will be executed under the following terms: Returns are accepted under the stipulation it is within 30 days from delivery date, verified by package tracking number. Buyer is responsible for return shipping cost in order to guarantee a full refund.